Teaching creative moms a smarter, leaner, faster way, to grow their income, make an impact and live life on their terms with their online business. Today I share what I’ve learned through my 8 months of the Keto lifestyle and my biggest tips. The sabatical is over! Tune in and find out how it turned out and whats coming next. An update on my sabbatical, my health, the results from the supplements I'm taking and my thoughts on prosperity and our soul. One of the things that I've learned since starting my own businesses is that who surrounds us either makes us or breaks us. Yes! The people we spend the most time with have a tremendous amount of influence over us. It is important that we become aware of how each person around us influences us and what to do when it's not an influence for the best. Today I share with you behaviors to look for, how to identify when it's time to part ways and what inner circle peeps looks like. Do you know woh your dream client is, how to find them and what they want? If you answered no, this episode is for you. Today I'll be sharing with you some updates that just rolled out for Instagram as well as some already existing features that are only available to Instagram business account users. So if you are new to Instagram or you're on the fence about switching from a personal account to a business account, you don't wan't to miss any of the information I'm sharing with you here today. How one single post on social media revealed a deeper issue. With 2.2 billion users Facebook has become one of the greatest opportunities for small business owners to grow their business and not break the bank. In today's episode, I share why it is so important to double down on Facebook and Instagram marketing right now. The minute you decide to start a business whether traditional or in network marketing, you become your own brand. This is something many people miss and it can cost you dearly. Learn why personal branding is so important for your business. With the growing trend of online courses, many entrepreneurs have been adding courses to their list of products leaving a big question to be answered. What id the best way to distribute my course? Today I'm going to share with you what options are available, their pro's and con's so that you can make an informed decision as to what solution is best for your business and what you are planning to do. #40 The Do's & Don'ts of social media and how they affect your business. I see this every day on social media and I had to say something about it. Let's talk about social media practices, and how our interaction affects our brand. Observing my mentors there are 3 attitudes that I've found they and all successful entrepreneurs have. Today I want to share with you what they are and how it has impacted my life. When I first started marketing my businesses on social media, I had no clue what I was doing. I was solely focused on the numbers and nothing else. All I wanted to do was gain a big following as fast as possible. And since that was my focus, I did great at it. I was amassing the followers quickly but... yeah, there was no conversion, sales or profits. My ad campaigns had turned into me bleeding out money every week for no results and a lot of frustration. Sounds familiar? Hey, don't feel bad if you drank the kool-aid, and believed the hype that said all you need to make money online is a large social media following. Today I share with you exactly what I learned in my own journey with social media marketing., the reason it is so important that you move past the glitz of large numbers and truly hone in on what's going to pay the bills. Today I want to share with you exactly how to start your own podcast quick and simple with no additional gadgets or fancy equipment. I'll share what tools I use and it's features. In this episode, we discuss what are the top pitfalls for new business owners and how to avoid them. You’ll learn why most businesses fail before they even get started as well as identify if you are in danger of making the same mistakes. 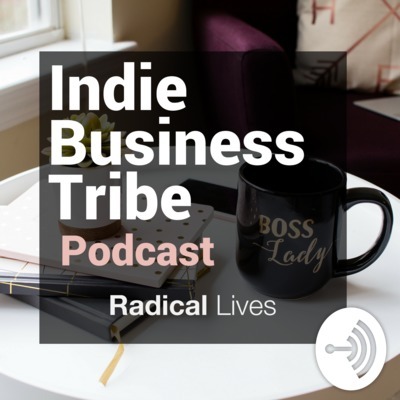 Join me for today’s episode of the Radical Lives Indie Tribe Podcast. Today we cover the importance of leadership and the health of your organization. I was updating my facebook when I stumbled upon a live video a friend was doing who BTW is a brilliant sales person. She’s in the jewelry business. How she was using it has triggered a huge growth in her jewelry business so I had to share this story with you. So many times when I’m working with entrepreneurs starting their journey, I hear about how they wish they could have been given the big bucks or that once in a lifetime opportunity that makes them millions over night. Yes that would be amazing. The only thing is instant success robs us from learning the fundamental skills we need to sustain the growth and momentum. Join me in today’s #podcast as I share what I learned in my own journey from starting at the bottom. Tap the link in my bio to catch episode 30 of the Radical Lives Podcast. You’ve heard it before, body language says more than words. Well what if I told you the eyes reveal what’s in the soul? Find out why you shouldn’t avoid eye contact in your next conversation. We’re all hardwired for positivity yet, there’s one thing that can sneak in if not careful and rewire us for the complete opposite. Find out what it is, and how you can protect yourself from being wired the wrong way. We’ve all experienced this. We have one unexpected event happen, and our mood for the entire day maybe even week is thrown off. Find out how to end that cycle once and for all. Tune in! This is something few speak about. Not everyone grew up in a well balanced environment. Some have been surrounded by toxicity all their lives so they truly don’t know another way. It’s so easy to judge and point fingers, however i want to challenge you reading this today to have empathy. For those who are trying to break free of toxicity it is very difficult. It’s actually a grieving process. They have to die to self and all they knew as normal. It means letting a part of who they identified themselves with go forever. That process takes time and courage. So while we should never tolerate toxicity, we all need to extend more love and grace. Becoming a better person is a journey, it takes time. Everyone has touchy topics that get us wound up, however some topics ignite a fire that sometimes can’t be put out. Find out how you can still stand for what you believe and preserve those relationships you value even when your view on some things are polar opposite. So you’re ready to start growing your team? Hiring and adding partners (downline) is a big step. Before you do, I want to share three things that will help you find the right fit for your organization and help you have amazing retention rates. We all feel it. That vibe when you walk into an organization and the environment is electric, exciting and inspiring. You walk out pumped and wanting more. But how exactly does that kind of environment take place? I’m gonna share the top 3 ingredients to an organization that rocks and thrives. Our routine can either make us or break us. This is one of the top reasons so many are stressed and burned out. In this episode I share the tool that transformed my life and how you can use it to help you get your life in that space where all you do energizes you rather than drain you. Rejection happens to every one of us at some point in life. Yet how we handle it is completely different. Today we go over the to 3 things you can do when experiencing rejection that will not only help you thrive and keep you from getting stuck in self destructive patterns. Ever been in one of those situations where you make plans, think a person in your life is a certain way and when you least expect it things take a turn. What do you do when life doesn’t go as planned? Well I’ve had my fair share of this and I want to share with you exactly how I got through those humps and became better instead of bitter. Wow, can you believe it? We’re down to the wire. We’re almost done with 2016! One thing is for sure 2017 is the year to conquer and thrive. So we’re spending the rest of 2016 addressing some topics that will set us up to do just that. Today we’re gonna learn how to work through emotions, confusion and learn what we can do right now to start getting clear. So if you’ve been struggling with limiting beliefs, working hard but not getting the results you want or simply not finding the drive to get to where you desire to be, this podcast is a must listen to. Let’s start 2017 on the right track. Quieting the mind and having internal peace is not something mystical that only a select group can accomplish. In fact any once can accomplish this by mastering these three areas. I remember what it was like to have a newborn, and try to be wonderwoman while running a business. It was hard and it left me depleted. I wan making a classic mistake and today I’m sharing exactly how to avoid those classic mistakes before they even become an issue. I’ve gotten so many messages over the last few weeks from all of you asking on advise because you’re feeling burnt out and I can so identify. I was there myself. In this episode I share 3 of the most popular reasons we tend to burn out as well and some solutions you can start implementing right now to start getting back on track. One thing that is vital to anyone who wants to continue to succeed in any area of life is the art of growing in skills. While hiring a great coach or mentor is always my number one choice, I know sometimes that’s not possible starting out. So even if you’re on a rice and beans budget (hey we all start there at some point) here are some great ways, to grow your skills and your income in the process. Most of us did some sort of journaling back in grade school. Yet as we’ve grown olders many have done away with the practice. Today I want to share with you the benefits of journaling and why you should adopt it as one of your business practices if you haven’t done so yet. If you publish different types of content to multiple content distribution platforms you already know that juggling the content schedule can be a doozie. So I’m sharing my simple fail proof system to help you stay organized, plan your content and execute a publishing schedule. There’s a saying that says “Success leaves clues”. So what is one of the clues some of the most successful people on this planet have left us? Let’s find out on today’s episode. When it comes to direct sales also known as network Marketing there’s really not a one way only method for achieving results. How ever there is some practices that all network marketing professionals will tell you, kill your business and it’s potential before it even gets started. Today I’ll be sharing the most common ones, why they hurt your business and what to do instead. Have you ever made a list of goal that quickly fizzled out? Hey you’re not alone. It turns out this is the case for most people. The problem is not the list, but rather the source of the goals. Let’s dive in on the juicy topic of making goals with soul. Hashtags are an amazing way to find people and get found. The key is learning how to use them correctly to achieve your goal. Here’s some tips to help you get started with hashtags on the right track. We don’t talk about it enough, but I know some of you are struggling with your business. Here are some tips on who to get it on the right track and keep it there. Grow your influence with people wether you have a leadership position or not. #6 Could you be talking them out of the sale? One skill all business owners need to learn is what to say and when to say it. I know, sometimes nerves or excitement get the best of us and we end up sticking our foot in our mouth. Find out how to avoid this big mistake. yeah I know, this is a topic that’s hard to digest. None of us ever want to think that we’re running in desperation. Yet so many new business owners do this by mistake and end up hurting themselves. Here is how to identify if you’re presenting your business in desperation mode and what to do about it. Whether you buy inventory to resale or make your own, wholesale is a topic that will come up at some point in time. Here are just a few of the things you need to know before you get started and some pitfalls to avoid. we all have mistakes in our past we’re not proud off. That doesn’t mean we have to live in their shadow or become a statistic. the truth is you can do something to change the path and create a new life. Everyone has desires to prosper, yet not all do. Why is that? Well it has to do with the blocks we have in our mindset. Today we’ll be revealing what some of those prosperity blocks are and how to move past them.